A student, lower left, is dwarfed by the fall-colored hickories, oaks and pine trees lining the path and edges of Coleman Creek as it winds through the University of Arkansas at Little Rock campus on Dec. 2. An northern watersnake allows the rushing water of Coleman Creek to cool and disguise him on a warm late summer afternoon in Little Rock. A small colony of these snakes inhabit part of the creek that runs through the campus of the University of Arkansas at Little Rock. Late spring and it’s nesting time for the long-eared sunfish. While the water in this urban creek is not strictly pure, it is incredibly clear. From one of the bridges over Coleman Creek, the circular outlines of their nests (last photo below) are visible. These nesting fish take any intruders very seriously, darting aggressively to chase them away. At the center of each stone circle is a fish ready to defend its territory. Every so often, the lawn near the fine arts building on the University of Arkansas at Little Rock campus turns into a showcase for student projects. Here’s hoping no ill winds will blow any time soon. HOUSE OF CARDS — Temporary installation near Fine Arts building on the campus of UA-Little Rock. Taken Aug. 21, 2015. ON THE FLIP SIDE — Playing cards installation at UALR. Taken Aug. 21, 2015. FIRST FRUITS — Temporary installation near Fine Arts building at UA-Little Rock. Taken Aug. 21, 2015. This week’s challenge is all about being connected. Shoes off and safely slung between two trees, a student takes advantage of a warm, sunny afternoon in a campus green belt to keep connected via cell phone. 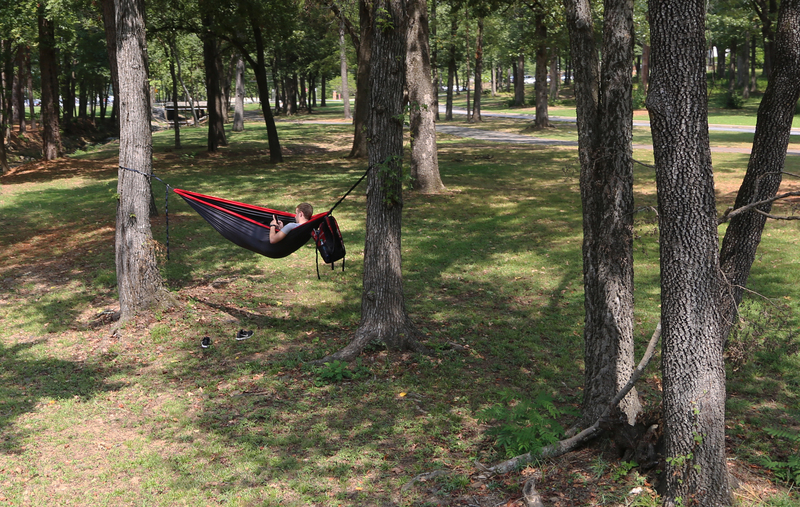 HANG OUT – Student at the University of Arkansas-Little Rock takes a break between classes in the Coleman Creek greenbelt. Taken Sept. 3, 2015. 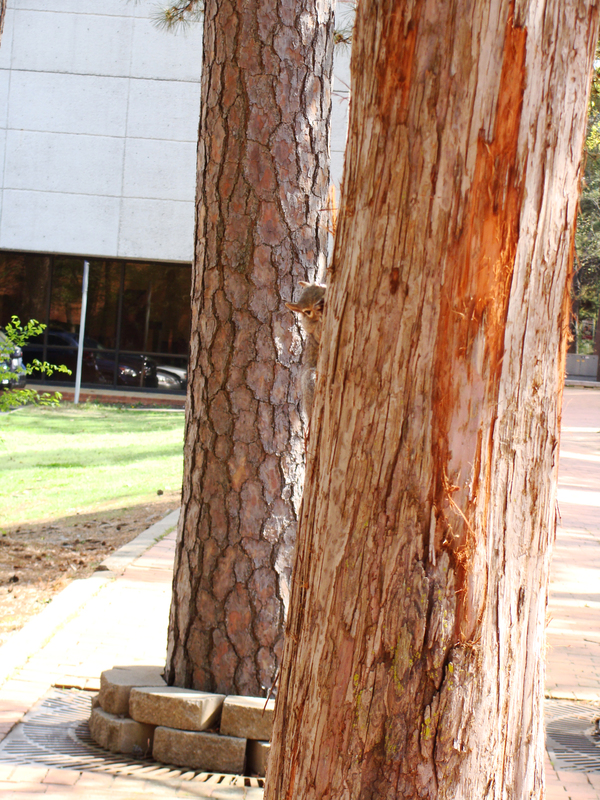 The squirrels on the UA-Little Rock campus are used to people — hundreds of people — tromping past at any particular time of day. SHREDS — Maybe cypress bark tastes good? 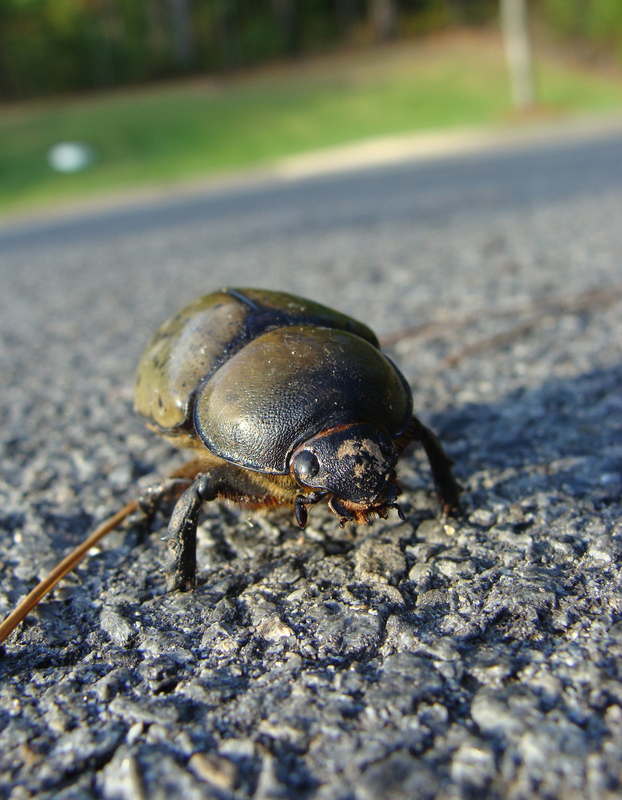 Generally, however, they will hop away to maintain a safe distance should a human make too close an approach. Not so with one squirrel, who was intent on a strange activity — stripping bark from a cypress tree. 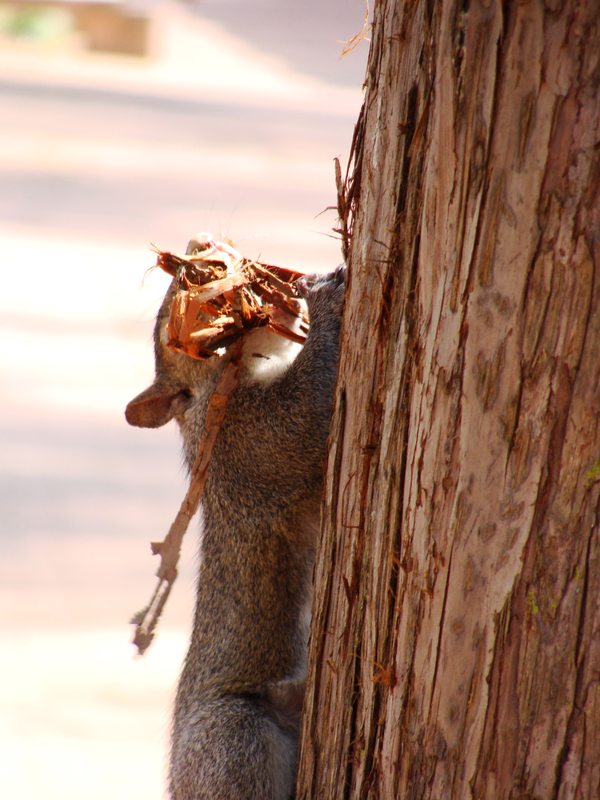 The squirrel hopped down, ripped up a mouthful of mulch, then hopped back up the tree (mouth empty) to begin ripping and stripping again. STRIPPER — This gray squirrel was busy grabbing shreds of bark from a cypress tree. SEEING RED — Reddish areas show where the bark-stripping squirrel has gone to town all over this tree. 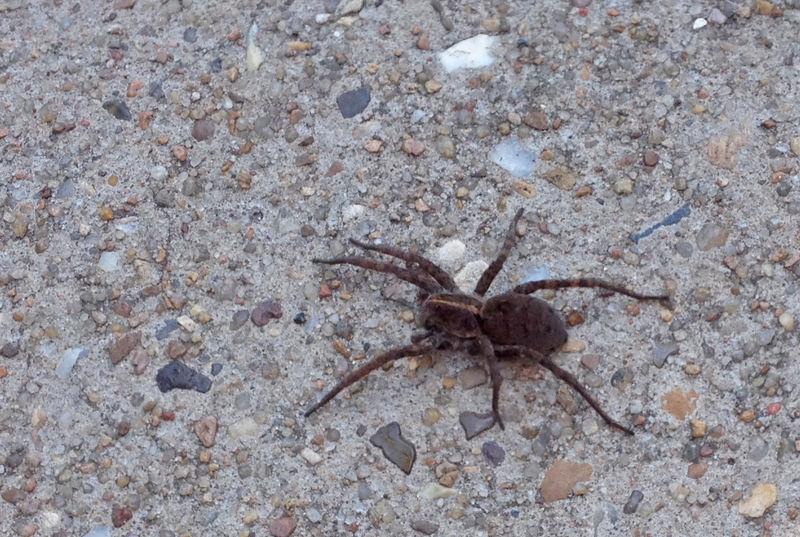 This substantial lady was identified as Arkansas’ largest wolf spider, Hogna carolinensis. My hand is next to her in the second photo for scale. Thanks to both Dr. John Hopkins, extension entomologist for the University of Arkansas System Division of Agriculture, and Dr. Jeffrey Barnes, curator o the University of Arkansas Arthropod Museum for the ID. BIG SPIDER — Wolf spider resting in the shade of a street sign on the campus of the University of Arkansas at Little Rock. 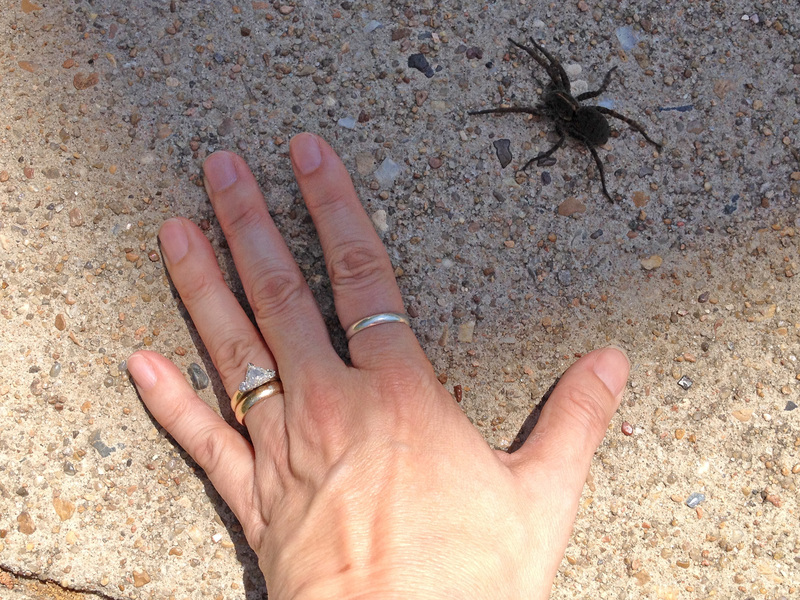 FOR SCALE — Photographer’s hand next to this large female for scale. Saw an unusual red bird during a lunchtime walk. A scarlet tanager? 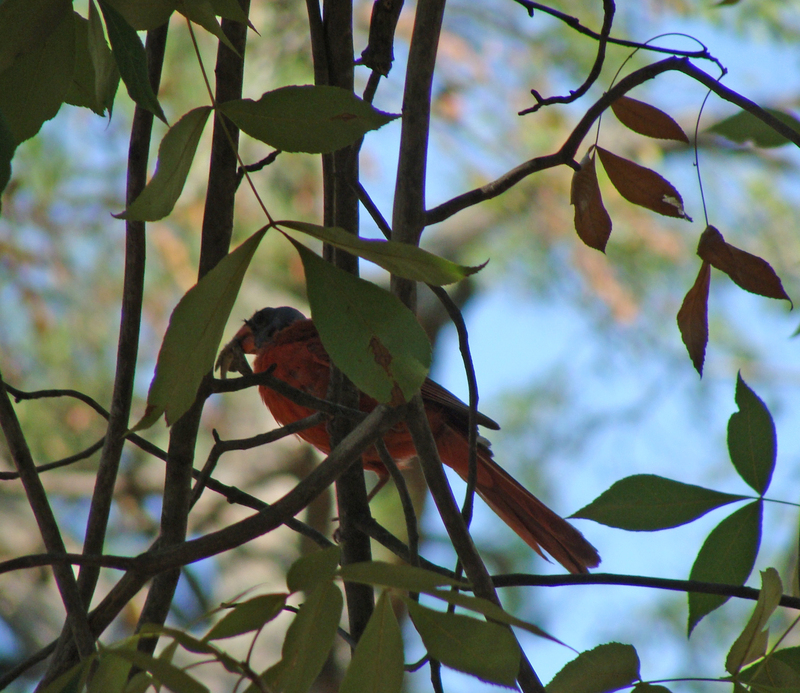 A summer tanager, or something else? A closer look showed him to be a cardinal — a bald cardinal. One colleague suggested this poor fellow’s condition the result of an extreme case of henpecking. HENPECKED? — A cardinal without headfeathers picks off some lunch on the campus of the University of Arkansas at Little Rock. GIANT –When you’re this big, it’s OK to have a dirty face. 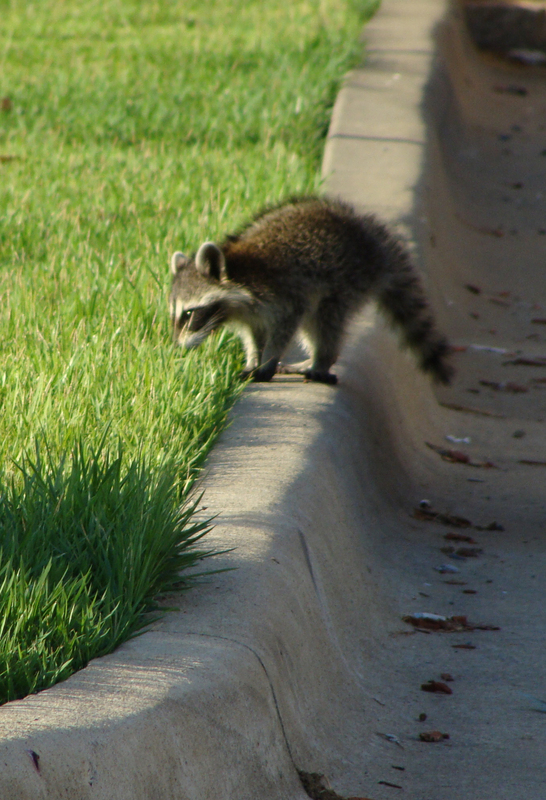 This baby raccoon is one of two that hang around the back door of the Stephens Center at UALR. 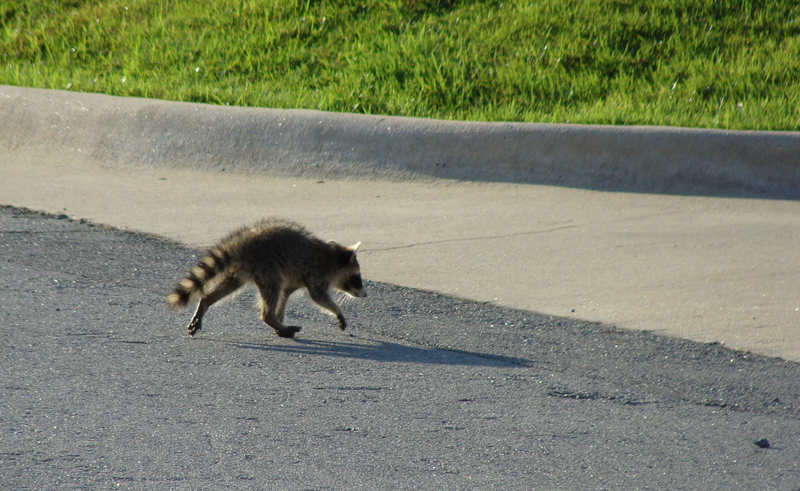 EATING OUT — Baby raccoon scampers across the parking lot, headed for a pair of Dumpsters.